For years I had been looking for something similar to this suit in other clothing stores but never truly became convinced of what I was buying. Having already bought the time coat by this time, I decided to give this one a try. What can I say? The brown suit has given me a lot of attention because of how sharp it makes me look. The material is breathable and not flimsy like an imitation. It\'s really a good call and a no-brainer. 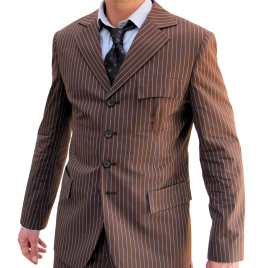 My comments are the same for this suit as it is for the brown suit. However, this is more of a lighter blue/teal color. I know they recently updated their blue to a darker tone but I\'ll have to order that towards the end of the year. Anyway, I wore this suit to an interview and immediately made an impression; needless to say that I got the position. =Both suits make you look sharp and you will not be disappointed with your purchase. Oh, and the pockets are definately bigger on the inside!